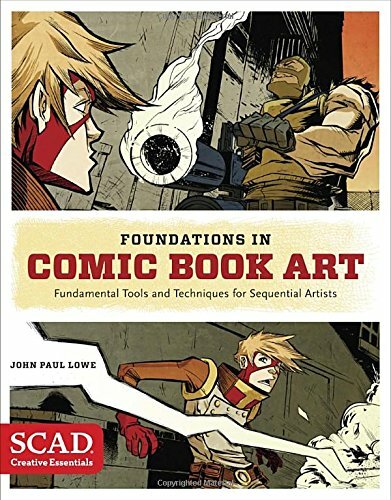 This instructional book on drawing comics by John Paul Lowe is more of a collection of tips and techniques rather than a structured course. Lowe focuses on only certain aspect of comic book drawings, mainly the technical skills. It's not meant to be comprehensive but for each subject covered, there are lots of practical useful information shared. This introductory chapter talks about desire and discipline to improve. Throughout the book, Lowe's tone is very encouraging and maybe that's because he has been teaching for years and really knows what he's doing. This chapter teaches the basics of drawing straight lines, seeing form and contour drawing. The 1, 2 and 3 point perspectives are taught. The main highlight is the use of cubes as a foundation to design buildings, populate a room and creating other objects. This chapter is quite short and talks about foreshortening and drawing multiple figures in groups. Here you'll learn about using thumbnails, photo reference, visual research, and turning a blue line sketch to ink. There are lots of useful techniques in this section. It talks about the various nibs and tools available for inking. You'll be able to practice different ways to ink and hatch. This interesting chapter looks at unconventional materials to create textures, masking, and alternative inking tools. It can be using dry brush for rough textures or using razer blades to cut out the white from inked areas. The last chapter teaches you how to create a perspective grid in Photoshop and Manga Studio. There's also a section on how you can use Manga Studio to apply screentone patterns. The great thing about the book are the exercises. Learning by following the exercises and drawing is faster than just reading text only. There are also many wonderful illustrated examples. Overall, this book works well as a complimentary resource to other drawing books. It will not teach you how to draw, but it will point out things to take note of when creating comic pages, stuff like using proper perspective, trying different hatching methods, etc. This book also reminds me of Bryan Hitch's Ultimate Comics Studio which is another helpful book that talks about techniques and various aspect of drawing comics. Both are good books to get together for beginner comics artists.